European Heritage, Dialogue and Digital Practices focuses on the intersection of heritage, dialogue and digital culture in the context of Europe. 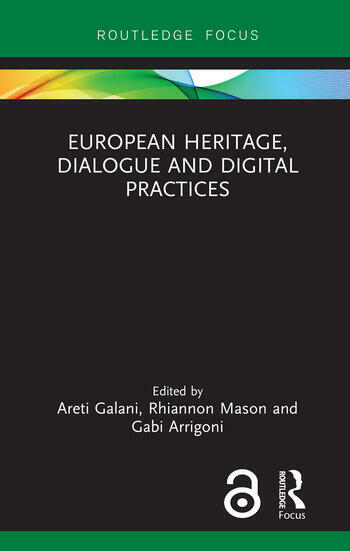 Responding to the increased emphasis on the potential for heritage and digital technologies to foster dialogue and engender communitarian identities in Europe, the book explores what kind of role digital tools, platforms and practices play in supporting and challenging dialogue about heritage in the region. Drawing on fieldwork involving several European museums and heritage organisations, the chapters in this volume critically engage with the role of digital technology in heritage work and its association with ideas of democratisation, multivocality and possibilities for feedback and dialogic engagement in the emerging digital public sphere. The book also provides a framework for understanding dialogue in relation to other commonly-used approaches in heritage institutions, such as participation, engagement and intercultural exchange. The authors map out the complex landscape of digitally-mediated heritage practices in Europe, both official and unofficial, by capturing three distinct areas of practice: perceptions and applications of digitally-mediated dialogues around heritage within European museums and cultural policy, facilitation of dialogue between European museums and communities through participatory design approaches, and non-official mobilisation of heritage on social media. European Heritage, Dialogue and Digital Practices will be of interest to both scholars and students in the fields of heritage and museum studies, digital heritage, media studies and communication, the digital humanities, sociology and memory studies. The book will also appeal to policymakers and professionals working in a variety of different fields. Areti Galani is senior lecturer in Media, Culture, Heritage at Newcastle University, UK, specialising in digital cultural heritage. She works with people-centred methodologies and research-through-design approaches to explore the role of digital technologies in heritage contexts, on-site and online. She has published on issues related to empathy, reflexivity, and sociality in designing and evaluating [digitally-mediated] heritage experiences. Rhiannon Mason is a Professor of Heritage and Cultural Studies and the Head of the School of Arts and Cultures in Newcastle University, UK. Her research and teaching are focused on heritage, identity and nationalism and she has published extensively around these topics as well as issues of emotion, memory and migration. Gabi Arrigoni is a researcher at Newcastle University, UK, in the field of digital cultural heritage. She focuses on future and design-based methods for heritage scholarship.